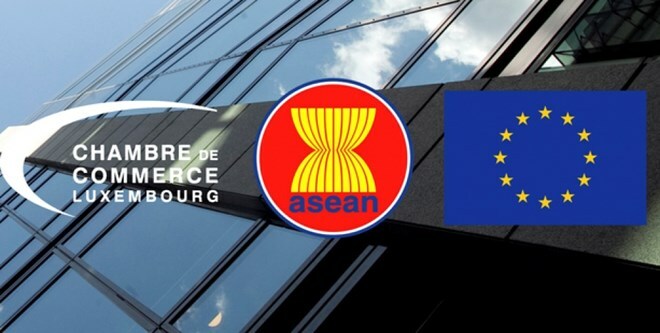 Brussels (VNA) – Luxembourg’s Chamber of Commerce and Ministry of Foreign and European Affairs have co-organised an ASEAN Day in the country to mark the 50th anniversary of the Association of Southeast Asian Nations (ASEAN) and the 40th year since the establishment of EU-ASEAN Dialogue Relation. The May 8 event brought together government officials of Luxembourg and representatives from the European Investment Bank (EIB) and local business circle. Vietnamese Ambassador to Belgium and Luxembourg Vuong Thua Phong attended the event. Speakers at the event lauded ASEAN’s role and position, highlighting the potential for cooperation between the two sides. They appreciated the conclusion of the Vietnam-EU Free Trade Agreement (FTA), describing it as a milestone to boost the relation between EU and not only Vietnam but also the ASEAN. Speaking at a meeting with ASEAN Ambassadors, Luxembourg foreign minister J. Asselborn affirmed ASEAN is an important Asian partner of the country and the EU. The minister also noted that the 20-year development cooperation programme between Luxembourg and Vietnam has brought about good outcomes.